A common question our estate planning attorneys at Puff & Cockerill, LLC receive is: What happens if you die without a will? The short answer is that your estate will be administered according to the intestacy laws of New Jersey. This short answer, however, is not so easily met in practice. Intestacy laws, including the process by which an intestate estate must be administered can be (and often is) complex, confusing and frustrating. Here is what happens if you die without a will in New Jersey, you are said to have died intestate. Intestate is a legal term that means that you have died without a valid will. In the absence of a will (which is a legal document that directs distribution of your estate) your estate is distributed in accordance with the State of New Jersey’s intestacy laws, which can, and often is, contrary to your wishes. In essence, what happens when you die without a will, intestacy laws create a framework for how your estate will be distributed. This framework of intestacy statutes are fact-specific, meaning there is no one-size-fits-all answer to intestacy distribution. For instance, depending on your family makeup (i.e. your marital status, number of children, existence of parents, siblings etc.) your distribution may vary in unexpected ways. The distribution process when you die intestate is called “administration.” Administration is the legal procedure that takes place from the time of your death until your estate and assets are fully distributed to your heirs as delineated by New Jersey’s intestacy laws. Administration occurs in the county in which the decedent died as a resident. The Surrogate Court of that county has jurisdiction over the administration. The Surrogate Court will appoint an “Administrator.” The administrator collects and preserves assets, pays off your debts and taxes, and finds your heirs and distributes your estate to them. Some of the legal duties include, but are not limited to, investing and reinvesting the assets of the estate, keeping all insurance policies paid and in full force, managing and selling any real property of the estate, settling all claims against the estate, filing any tax returns for the estate, filing any inheritance tax returns for the estate, and continuing any of the decedent’s businesses. In addition to the foregoing duties and responsibilities, the administrator must also receive the “Letters of Administration.” These letters grant the administrator the authority to handle the estate. Letters of Administration are granted after ten days have passed from the date of death. The person seeking to be appointed administrator must travel to the County Surrogate’s office and apply for administration. The applicant must bring a copy of the death certificate, fill out proper forms, and pay a filing fee of approximately $200. Most importantly, the County Surrogate Court will normally require an applicant for administrator to post a bond for the estate. The bond serves as insurance that the administrator will not steal the assets of the estate. The cost to obtain a bond increases with the size of the estate and is a reoccurring expense for each year the estate is open. The bond costs can run into the thousands of dollars and the administrator needs to be credit worthy to be appointed. This very significant issue can be avoided with a properly drafted will. All told, the administration process can be quite expensive and time-consuming. Don’t die without a will in New Jersey! Due to the complexities and intricacies of the intestate laws, including the estate administration process, our estate attorneys of Puff & Cockerill, LLC are available to help ease the burden and navigate the legal waters. Our estate planning attorneys are experienced and well-versed with the particular nuances of intestate succession, intestacy laws, estate administration and litigating contested estate issues. 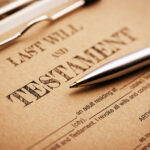 Comments Off on What happens if you die without a will in New Jersey?